Tony Bedard's second volume, R.E.B.E.L.S: Strange Companions, is criminally undersized collection -- just three issues and an annual. Maybe that equates about five issues, but if you compare it to the same-priced six-issue Wonder Woman: Warkiller, the latter feels like quite the more complete read (as well as offering more bang-for-your-buck). None of that is Bedard's fault necessarily, however, and indeed R.E.B.E.L.S is so good -- both for the nostalgia factor, and what it creates from scratch -- that the main problem is just waiting for the next volume. Strange Companions, as it sounds, deals with more team-building for the R.E.B.E.L.S. 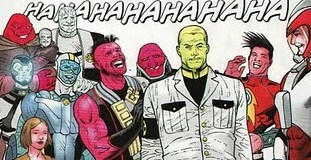 -- or, if the previous volume, The Coming of Starro, built the team, then Strange Companions establishes R.E.B.E.L.S. 's larger society. There's a panel in the third chapter of the established cast that nearly crowds off the page -- not just the main team, but spouses, children, various dignitaries from alien species, even a guest hero and villain or two. It leaves no question that Bedard is universe-building here, creating a rich tapestry for R.E.B.E.L.S. that's just right for a space opera, much in the vein of Star Trek: Deep Space Nine. The downside is that no one cast member really gets the spotlight this time, when -- given that this is a relatively new series and cast -- we might benefit from knowing a little more about everyone. Wildstar remains something of a cypher, and Bounder even more so -- we don't know at all how Bounder relates to Strata or why he stays with the team, for instance. The most prominent character is exiled Dominator Xylon; Bedard gives Xylon a warrior's grace despite his single-mindedness, not unlike the depth ultimately given (again) to Star Trek's Klingons, and Xylon's "kill millions to save billions" mentality is perfect (and perfectly dangerous) alongside Vril Dox. 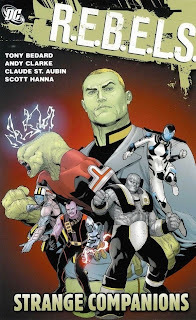 Bedard has demonstrated a natural voice in bringing to life the militaristic Dominators in his guest stint in the Legion trade Dominator War, and I'm glad to see that attention given to these long-time DC Univese aliens. By far the real star of the book, however, is Starro himself. In one single annual, Bedard takes what's been so far a rather stereotypical dictator and his followers and makes them entirely dynamic on the page. Each story in the annual -- that of Storm-Daughter, Smite, and Starro himself -- is better than the one before. Starro is in a way like John Byrne's early Lex Luthor, teasing and tempting each character until they don't know good from evil, and both have lost so much that they have no choice but to follow Starro; it's gripping stuff. And then Bedard presents the clincher, that even the starfish that rides on the Starro dictator is a slave to him, desperately wanting to be free. Starro carries a hostage right on his body; this underscores well just how evil this character is (letting alone the long-established DC villain that Starro knocks off here). It's another complication, another thread in the aforementioned tapestry, and that's the part of R.E.B.E.L.S. that has me hooked. What I'd like next time, of course, it just more. R.E.B.E.L.S. : The Son and the Stars will be five issues, including a Blackest Night tie-in; that's no more than what's here, really (though at a higher price), but at least it's five current, real-time issues, and maybe that'll seem more substantial. Strange Companions demonstrates that R.E.B.E.L.S. has what it needs; now I'm just eager to see it take off. I too was majorly unimpressed with the size of this volume, but it was a ridiculously good read that felt satisfying, far superior to the first volume. The original series was a huge favorite of mine and this is a worthy successor. I especially like the appearances by the various Invasion! aliens. I was reading the first new Batgirl trade the other day -- seven issues! It just reinforced to me how criminally short this collection was. But -- you hit it on the head mentioning the Invasion! aliens. This is an old school-style DC series -- Bedard's not trying to reinvent the wheel, but rather taking a well-established tapestry and putting it to good use. Maybe some think the book is too 1980s/1990s, but I'm pleased. I'll be happy when some of this seemingly endless set-up and origin work is complete, and Bedard can let loose really telling REBELS stories.